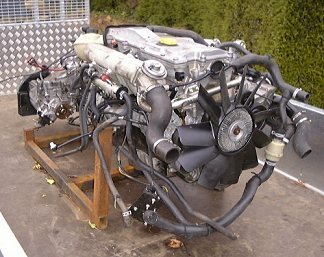 The idea of an engine swap for my Defender had been going through my Dad's head for a while, mainly because when I was at university (from October 2002) he was using it to tow his racing car trailer with, and the TD engine wasn't really up to dragging the car and trailer at a respectable pace. We were set on getting a 300Tdi, and fitting that at the start of 2002. See this thread on the LRE forum. It was a complete Td5 engine and R380 gearbox (complete with LT230Q transfer box) out of a stolen/recovered Defender 90, which had been recovered without the engine, a new engine fitted courtesy of the insurance company, and then the original drivetrain recovered. Being surplus to requirements, it was being sold on. First thing we had to do was compile a list of all the bits we needed to carry out the transplant properly. The one component that were were worrying about was the fuel pump. The Td5 uses an electric diesel pump, which has two stages: a low stage 'lift pump' to get fuel out of the tank and to the filter, and then a high pressure (1.5bar/nn psi) stage which supplies the engine. Unfortunately the pump is also an in-tank unit which won't fit the older under-seat tank, and we couldn't find an aftermarket pump which can be used with the existing 90 tank. So we decided to go with the new Td5 tank, which sits at the back of the vehicle, underneath the rear floor and the new pump. These bits were ordered from Guy Salmon in Stratford (local LR dealer, who we'd used for various bits during the main restoration and conversion of F913 PUY. They all arrived within a couple of days, with the exception of the intercooler, which was on back order from Land Rover, and they couldn't guarantee a delivery date. They did get a Discovery Td5 intercooler, which we tried and could have been made to fit, but not without modification to the radiator and the radiator mounting brackets. So a ring round the Land Rover specialists located a new Td5 Defender intercooler at Town & Country Land Rover in Cubbington, Leamington Spa, so we bought that one rather than waste time messing about with the Discovery intercooler. So with all the bits in, it was time to prepare my Land Rover for the transplant..